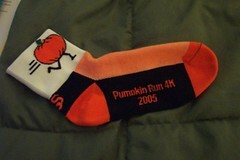 The Pumpkin Run socks have arrived and they look great! Giving away socks to the runners instead of yet another t-shirt is something that we’ve done every year. It’s one thing that makes our race unique. In the past we’ve purchased the socks from DeFeet, but this year we’re using Save Our Soles. The service and delivery was excellent and the socks are great! We’ve put this year’s logo on the sock and in my opinion, these turned out the best of any of the socks yet. 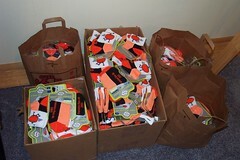 If you were lucky enough to get your registration in on time, we hope you like this year’s socks! This entry was posted in Everything, Pumpkin Run on October 20, 2005 by Dave.